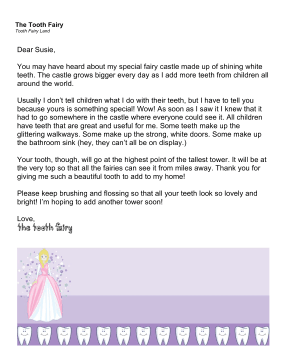 In this free, printable letter, the tooth fairy tells the child about how all lost teeth are used to make a castle in fairy land. You may have heard about my special fairy castle made up of shining white teeth. The castle grows bigger every day as I add more teeth from children all around the world. Your tooth, though, will go at the highest point of the tallest tower. It will be at the very top so that all the fairies can see it from miles away. Thank you for giving me such a beautiful tooth to add to my home! Please keep brushing and flossing so that all your teeth look so lovely and bright! I'm hoping to add another tower soon!